1.Question. Describe the ways in which the Buddha tired to spread his message to the people. 1. Buddha taught in the language of the people, Prakrit, so that everyone could understand his message. 2. He spent his life in traveling on foot, going from place to place, teaching people, till he passed away at kuarnara. 3. He also encouraged people to think for themselves, rather to simply accept what he said. 2.Question. Write whether True or False. 3.Question. What were the questions that Upanishadic thinkers wanted to answer? (1) They wanted to know about life after death. (2) They wanted to know why sacrifices should be performed. (3) They believed that there were something permanent in the universe that would last even after death. They described this as 'atman' or individual soul. (4) They believed that ultimately both the atman and the brahman were one. 4.Question. What were the main teaching of Mahavira? (1) He taught a simple derive: men and women who wished to know the truth must leave their homes. (2) The must strictly follow the rules of ahinsa, which means not hurting or killing living beings. (3) To all things life is dear. 5.Question. why do you think Anagha's mother wanted her to know the story of Buddha? Answer.Anagha's mother wanted her to know about the story of Buddha because she was going on a school trip to Varanasi. Varanasi as many places like Sarnath, which are closely related to the life of Buddha It would have enriched her knowledge about one of the greatest teacher and preacher of ancient times. 6.Question.Do you think it would have been easy for slaves to join the sangha? Give reasons for your answer. Answer. Those who wanted to join the sangha had to take permission of their parents or their masters. The masters would not give permission easily, because slaves worked very hard and did not get wages. So it was difficult for the slaves to join the sangha. 7.Question. Make a list of at least five ideas and questions mentioned in this lesson. Choose three from the list and discuss why you think that they are important even today. 1. Life is full of sufferings. 2. People should be kind to other and respect all lives. 3. People should be taught in their own language. 4. People should know about life after death. 5. People should lead simple lives. 8.Question. Find out more about men and women who renounce the world today. where do the live, what kinds of clothes do they wear, what do they eat? Why do they renounce the world? Answer. 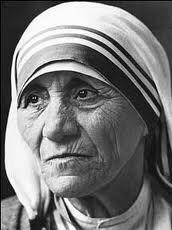 Mother Teresa was one such lady who gave up worldly pleasures and decided to serve humanity. She had become a nun at very early age. The sufferings of the people, especially the people affected by leprosy, made her serve humanity. She started many homes, where the sick, old and infants were looked after. She wore simple clothes, a white cotton Saree with a blue border and ate the same food as other.